Why we need more writing on interaction design. Interaction design is a weird discipline. It shapes our perception of digital technology. It makes complex digital systems understandable and manageable. It provides access to huge information systems. It allows people to participate in all kinds of online social activities. It defines the look and feel of soft- and hardware. It is a truly global design. And yet — it is not a popular subject of public debate. On the one hand, this is not surprising. Interaction design tends to be a discreet and unobtrusive discipline. In some ways it is like typography. Most people take words on paper for granted and spend very little time on the question of why some texts are more pleasant to the eye and easier to read than others. The same is true for interaction design. We take computers — in all their forms — for granted and don’t think too much about the intricacies of the interface and interaction design. Unless, of course, the design is really bad and stands in the way of the things we want to do. On the other hand, it is astonishing. Currently, interaction design is the most influential design discipline. In September 2016, Facebook reported 1.18 billion daily active users. We now have more than 2 billion smartphones worldwide. 80 Million photos are uploaded to Instagram every day. This is not only a huge technological feat — it is also a major design achievement. Good interaction design enables people to participate in the digital world. And the impact of interaction design is tremendous. If Facebook changes the design of its website, it has implications for about 15% of the world population. I don’t mind that interaction design is slightly obscure. But I believe that we — as interaction designers — should talk more about what we actually do. Our work is clearly relevant. Not only our community would benefit from a more comprehensive discourse, but also related disciplines. In order to contribute to such a debate, I will publish a series of short essays on interaction design in the next few weeks and months. As I believe that debate also means personal engagement with experts and professionals, I will — prior to publishing — discuss every essay with a colleague. So in a way, every essay will be reviewed and challenged in two stages. First from a peer, then from the Medium community. In the essays, I will reflect on my work as a practitioner, teacher and academic. I have very consciously chosen the form of an essay. Vilém Flusser once wrote an excellent text on essays in which he juxtaposes the form of the essay with the form of the treatise. Flusser argues that the distinction is of existential nature. The author of an essay identifies with the topic and must take full responsibility for his or her statements. The author of a treatise, on the other hand, dissociates himself or herself from the topic. As a practicing designer, I obviously cannot dissociate myself from the subject matter. So choosing the form of an essay was the obvious decision. 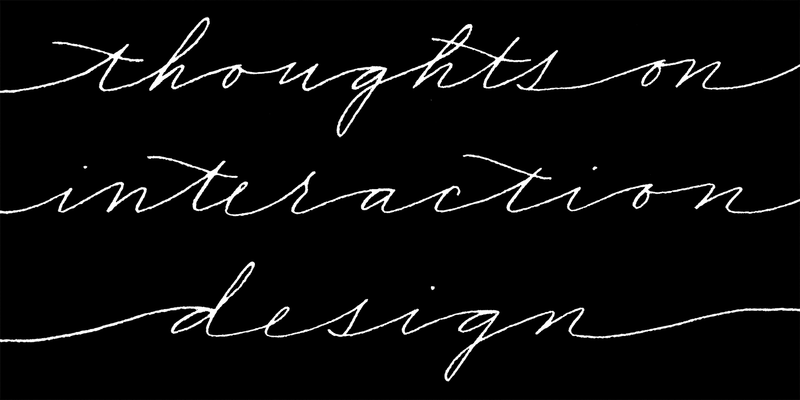 For me, it is a suitable framework for my thoughts on interaction design. Note: This posting was originally published on Medium on 5. January 2017 under the title: “Thoughts on Interaction Design”.